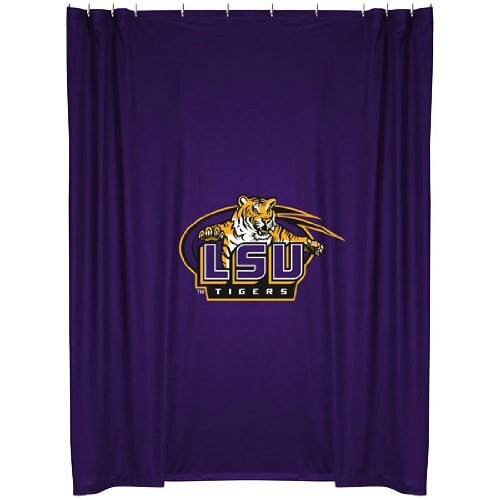 LSU Tigers COMBO Shower Curtain, 2 Pc Towel Set & 1 Window Valance/Drape Set (84 inch Drape Length) - Decorate your Bathroom & SAVE ON BUNDLING! CONTENT: Two rod pocket curtain panels totally measuring 82 inches wide (horizontal) x 84 inches long (vertical) or 208 x 160 cm with matching tie-backs. One valance with screen-printed logo 88 inches wide (horizontal) x 14 inches long (vertical). One bath towel measuring 30 x 54 inches (76.2 x 137.16 cm). One hand towel measuring 16 x 30 inches (40.64 x 76.2 cm). One jersey shower curtain measuring 72 x 72 inches (182.9 x 182.9 cm). One Louisiana State Tigers valance, 2 curtain panels (total 82 x 84 inches) and two tie-backs. One bath towel, 30 x 54 inches, and one hand towel, 16 x 30 inches. One logo shower curtain.